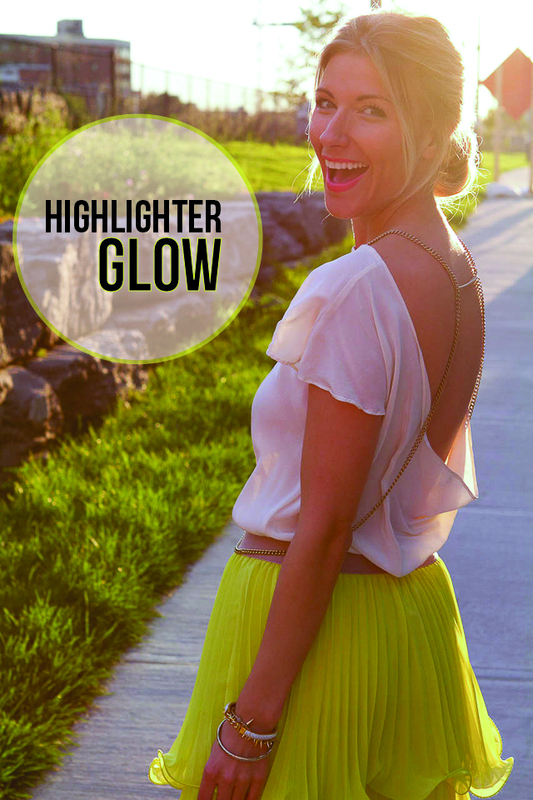 Who said wearing neon couldn't get a little fancy! Combining pleats and ruffles in a highlighter hue this skirt is a whole lot of fun and does not go unnoticed when worn. To keep this look on the pretty side I neutralized the look by wearing this off-white silk blouse that had it's own element of surprise; being backless. Perhaps with all these elements going on in one look you might think to stop there but I decided to push this looks limits a little further. Body chains have been creeping on the style scene for a while now and this one by ARMED (here's another post featuring this jewelry line) fit so seamlessly with my blouse. I finished this look off with my favourite shoes of the season by Sam Edelman. These tribal looking pumps are so comfortable and because of the fun punch of colour I find myself wanting to wear them with just about everything. so beautiful in these pics. i like this look!